Has this ever happened to you: you are going about your day and something happens that totally ticks you off. You become completely frustrated and irritated as if from out of nowhere. The dust settles, some time passes, and then you wonder Why in the world did I just get so angry? Why do we get angry?? What is our anger really about? Last week we started a discussion on anger. We defined anger and discussed that anger does not have to be destructive. Stuffed anger is just has harmful to our spirits and relationships as out of control anger. We keep anger from being destructive when we learn to identify what anger feels like in our bodies and how we act in anger. It’s normal to feel angry; it’s what you do with and in it that really matters. We left off last week by saying that anger is a secondary emotion. Of all the things I’ve learned about anger, this little fact has been the most helpful. What does it mean that anger is a secondary emotion? Like an iceberg with it's tip rising above the ocean, there is much more going on than initially meets the eye. It means that there is always another emotion behind anger, and that emotion goes much deeper than the anger that is exploding above the surface. Yes, you may feel angry… really, truly angry. But there is another emotion that is fueling that anger. Learning to manage your anger means digging past your anger and identifying that root emotion. It is that root emotion that needs to be recognized and shared. Staying in your anger rather than taking the time to understand the true emotion that is fueling that anger will block anyone, including yourself, from really knowing and understanding you. Your anger then becomes a mask that keeps your authentic, vulnerable self from being seen. If we want to develop closer, more intimate relationships, we must learn to lower that mask. The three emotions that I find are often at the root of our anger are fear/anxiety, shame (feeling insecure or not good enough), and hurt (specifically disappointment). Let’s take a closer look at how each of these feelings can pave the way to anger. Anxiety is a feeling of fear or dread of something unknown that may or may not be real. Anxiety and fear are parts of life. Yet, so often when we are angry, if we dig real deep we may realize we are actually feeling anxious or scared. We can feel anxious over everything from running late to church (confession: I snap at my husband more on the way to church than any other time we’re in the car. Lovely I know) to worrying if our children are going to grow up to be serial killers because they won’t eat to green vegetables to wondering if our job is in jeopardy. When we are feeling anxious or stressed, we are much more likely to respond to someone in anger. Let’s look at how this might play out… Work has been particularly stressful lately and there has been talk of layoffs. The environment is tense, and you are taking on extra projects trying to prove your worth and value to the company despite the air of uncertainty. You also notice that everyone in your life just happens to be especially irritating lately, and you have been arguing more with your spouse and family members. Simply put, you just feel crabby, irritated, and all around angry. What is going on here is not that you are now an angry person or that everyone you know is all the sudden irritating, but really you are feeling anxious about the uncertainty of your job. Anxiety and fear leave us feeling weak and exposed. We counter that powerless feeling with an emotion that makes us feel “powerful”. All that adrenaline pumping through our veins certainly does make us feel powerful. In truth, though, it is a false sense of power… a false sense of power that is very seductive. That seduction is why we keep returning to the trough of anger again and again when we feel weak and powerless. If you can slow yourself down and identify the anxiety, then you will be able to handle your anger in a more productive way. You will be able to communicate that you are feeling nervous about your work situation, and you will connect with your loved ones at a deeper level. Understanding that we are angry but then understanding what is actually behind that anger is what allows us to build emotionally honest and vulnerable relationships. Recognizing this connection between anger and anxiety/fear can be a real a-ha moment and learning to honestly and vulnerably communicate your fears can prevent all sorts of unnecessary conflict. There is nothing that sends us into anger quicker than feeling insecure, unworthy, or not good enough. Feeling inadequate quickly triggers both our anger and anxiety, and in these situations we are inclined to either withdraw or lash out. Take a second and think of a time when you felt insecure or unsure of yourself? In that moment, how did you react to those around you? Did someone else bear the brunt of your feelings of inadequacy? When we are feeling insecure or wondering if people are judging us, it is so easy for us in turn to become disgruntled and critical of others. When we are feeling bad about ourselves we are much more likely to use criticism and shame as our weapon of choice. We spew our shame onto someone else as a way of disconnecting from the pain of that shame. 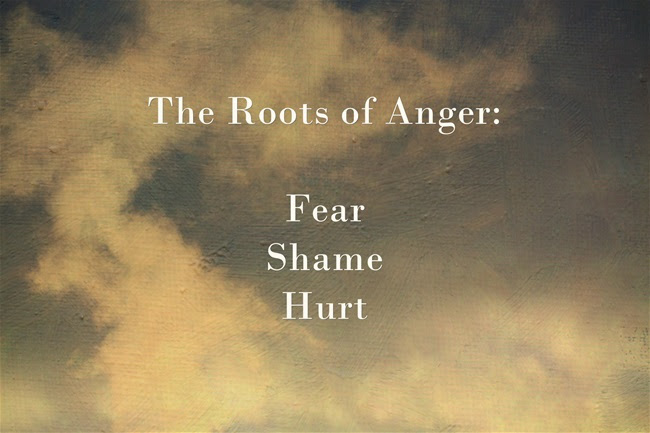 Looking at this root of our anger takes a lot of courage because we do not like to admit we feel insecure, and we really do not like to pinpoint the things that make us feel insecure. We feel insecure about our insecurities. Slowing yourself down and learning to identify that your anger is masking deeper feelings of unworthiness or inadequacy, allows you to begin to address and heal those painful feelings. You can then share what is truly bothering you rather than picking a fight with someone and covering them in your shame-induced-anger. Feeling hurt is a raw and tender root of anger, and hurt is often linked to disappointment. Whether we mean to or not, we have expectations. We have expectations for everything from a trip to Target to what our future is going to look like to how a dinner or a conversation or a vacation is going to go. When things do not go as planned or hoped, we feel disappointed and that disappointment may manifest as anger. This happens all the time, and it is a great example of how we try to bury sharing our true feeling and deflect that disappointment by getting angry. Disappointment-induced-anger can be especially dangerous when we are unaware we had any expectations to begin with. It is in those scenarios when, if we are unaware of our own expectations, we are more likely to react defensively and blame another person. We do this because we are in a fight/flight response and our mind’s automatic response/goal is survival. We try to “survive” this disappointment by shutting down the emotion and turning it into anger. We have to teach our mind’s automatic response that there is another way. In sharing our true emotion, in this case disappointment, we are actually practicing vulnerability and openness, which will create more intimacy in the relationship. Are you seeing a pattern here? We use anger to shut down and mask the emotions that leave us feeling weak or exposed or uncomfortable. But ultimately, this mask does no one any good. We have to slow ourselves down from reacting impulsively in our anger. Anger that is impulsively fired off injures individuals and relationships. But when we slow ourselves down, peel back the layers, and look at the true emotions behind our anger, we build awareness in ourselves and intimacy in our relationships. So here’s our challenge. Everyone is going to have a bad day. Everyone is going to have a day where they have a little less patience. Everyone is going to feel frustrated, anxious, insecure, disappointed at times. It is normal. It is okay. The challenge is what are you going to do with those feelings. Are you going to let them turn into anger or are you going to spend some time understanding and sharing them? Yes, we get angry, but anger is not always our true emotion, so to speak. Often, anger is a mask hiding our genuine heart. If you want to live authentically, if you want to be known and understood, if you want to practice vulnerability, you have to name and share the true emotion behind your anger. That is being emotionally honest. That is letting people really see you. That is how you find your voice. Think about the last time you got angry. What was the true emotion you were experiencing? What would it be like to share that truth with the person who received your anger? How would your life change if you made it a practice to ask yourself when you get angry, “Am I feeling anxious/fearful, insecure/not good enough, or disappointed/hurt?” and then shared those feelings with someone you trusted.